Description: Summer has come early to the town of Drumheller, Alberta. The Screech Owls were expecting deep winter – just like back home – but when they arrive for the annual Dinosaur Pee Wee Tournament, they find a warm chinook has blown the winter cold away. Drumheller is the “Dinosaur Capital of Canada,” home of the fierce Albertosaurus – cousin to Tyrannosaurus rex – whose ancient bones were discovered here more than one hundred years ago. It’s also the home of sports psychologist Kelly Block, whose weird ideas on how to build a better “team” threaten to pull the Screech Owls apart. But nothing is as weird as what happens to Nish and the others in Dinosaur Valley. When Nish returns from mountain biking, he claims he almost became breakfast for a living, breathing Albertosaurus! Of course his friends don’t believe him, but when Travis, Sarah, and their teammates go for their own ride in the hills, they come back with a monstrous story that makes international headlines. 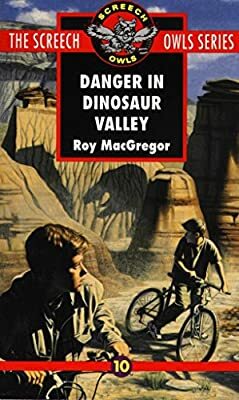 Danger in Dinosaur Valley is the tenth book in the Screech Owls Series.